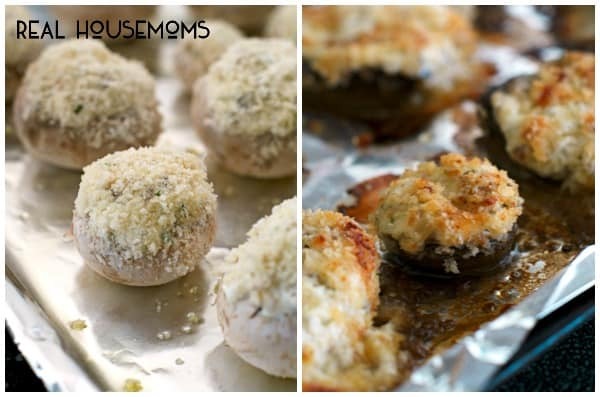 THREE CHEESE STUFFED MUSHROOMS are a party perfect appetizer made by stuffing mushrooms to the brim with three kinds of cheese and topping them with buttery panko breadcrumbs! 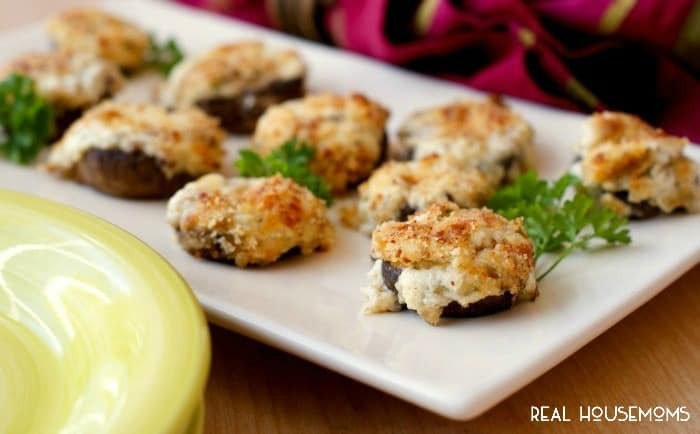 If you have been looking for a recipe for the ooiest, gooiest, meltiest, cheesiest stuffed mushrooms around, look no further! 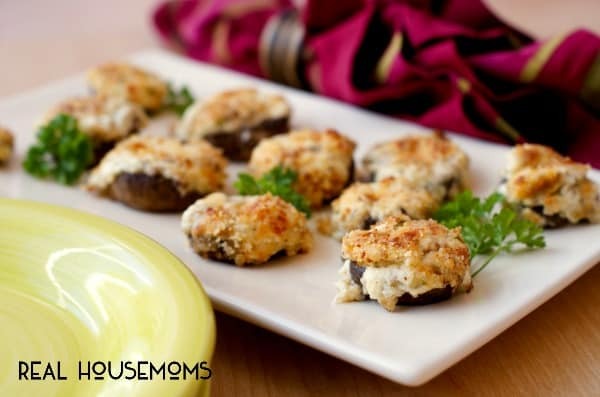 Stuffed mushrooms are a classic, timeless, easy to make appetizer. 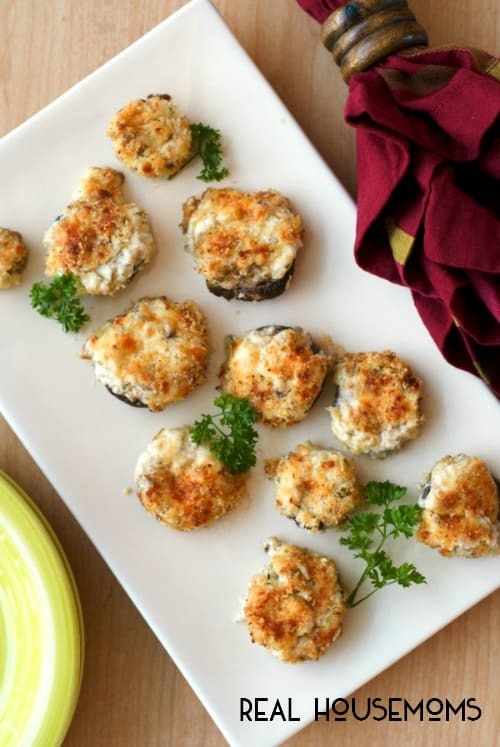 There are so many variations out there, but most, including this one, feature a cheesy mixture stuffed inside the mushroom cap. 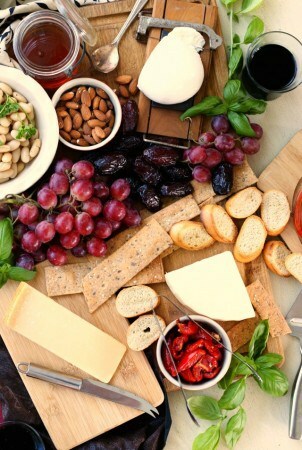 My version features not just one kind of cheese, but three cheeses: asiago, mozzarella, and parmesan. Then there’s cream cheese, so technically you could say there are four cheeses! Either way, these are filled will tons of cheesy goodness. I like to stuff my caps extra full of the cheese mixture so that it oozes over the edges and get little crisp bits on the pan. If you want a neater presentation, just use more mushroom caps and less filling. But, I like ’em messy. No one said tasty food can’t be a little messy. If you want to save time, you can forgo the hand chopping of the veggies and use your food processor. I kind of like the chopping, though. Cooking for me is almost meditative and I figure that I have to wait for the oven to preheat anyway, so I might as well do the prep by hand! A food processor will make quick work of it, though, if that’s your thing. Once you pull these babies from the oven, you won’t be able to resist digging in! If you’re making them for a party, count on at least 3 per guest. The recipe can easily be doubled or tripled depending on the size of your gathering! I swear I could eat the entire recipe myself. 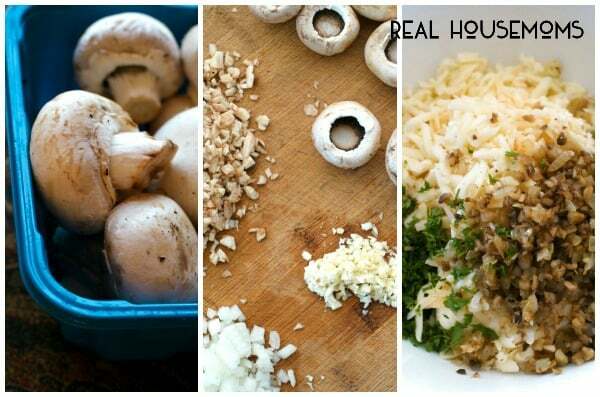 You will love the rich, cheesy filling, the tender, earthy mushrooms, and the crisp, golden, buttery breadcrumb topping. Make them for your next get-together and watch them disappear! 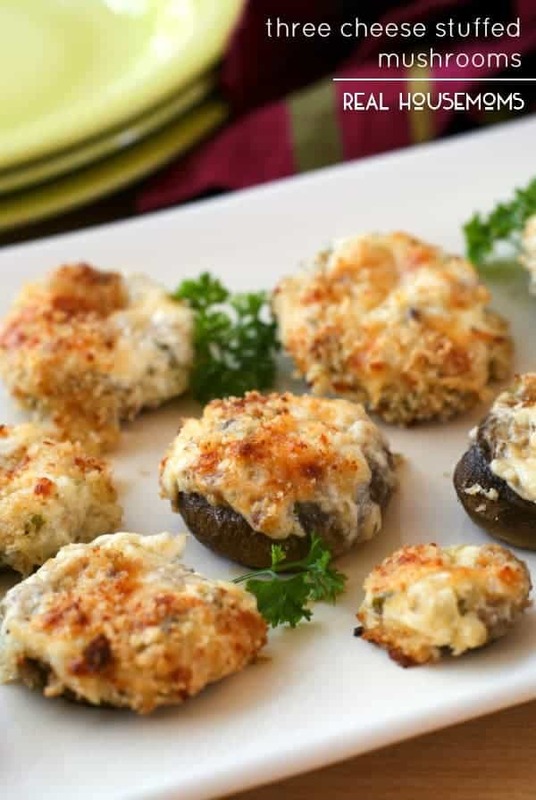 Three Cheese Stuffed Mushrooms are a party perfect appetizer made by stuffing mushrooms to the brim with three kinds of cheese and topping them with buttery panko breadcrumbs. Preheat your oven to 375 degrees. Line a baking sheet with foil and lightly grease. Snap the stems from the mushroom caps and place the caps onto the baking sheet. Sprinkle the inside of the caps lightly with salt and pepper. Finely chop the mushroom stems. Heat the olive oil in a pan over medium-high heat. Cook the mushroom stems and chopped onion in the oil for 4 minutes. Add the garlic to the pan and cook for an additional minute. In a bowl, stir together the softened cream cheese, shredded mozzarella, shredded asiago, parsley, and mushroom mixture until well combined. 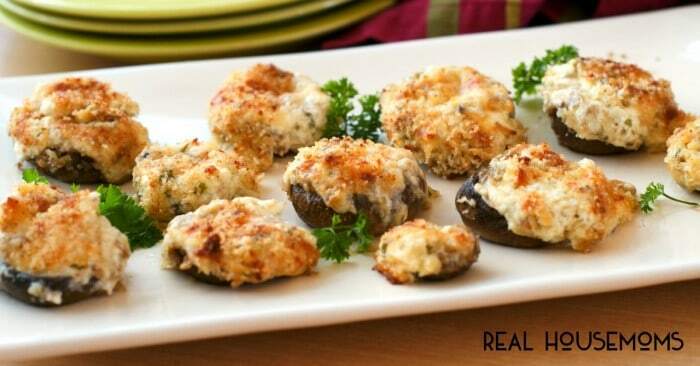 Fill each mushroom cap with a heaping spoonful of the cream cheese mixture. In a small bowl, combine the breadcrumbs and parmesan cheese. Dip the cream cheese side of each mushroom into the panko mixture pressing down lightly to cover the tops of the mushrooms with the mixture. Drizzle the mushrooms with the melted butter and bake for 20-25 minutes or until golden brown. Don't sweat it if the cheese melts out of the caps a bit. The crispy cheese on the pan makes the mushrooms even better! 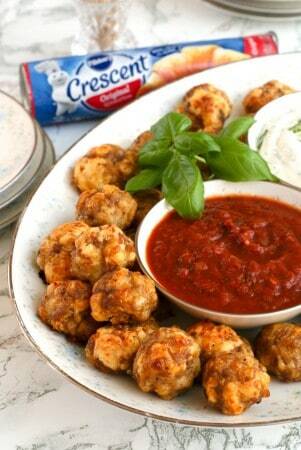 Round out your appetizer spread with The Ultimate Cheese Board and Italian Sausage Crescent Cheese Balls! Can you make these the day before and cook them the next day? Or would it not come out right? Took 1/3 pack of cream cheese, 4 cheese mexican blend shredded, shredded mozzarella, vadaillia onion powder, fresh parsley chopped, jalapeño seeds removed diced and mixed it in a bowl with my hand wearing a rubber glove. Did not measure anything. Bought some mushroom crowns, salt and peppered insides and played them on baking sheet covered with foil and sprayed with oil. Mixed parmesian cheese and bread crumbs is a small bowl. Used small ice cream scoop to put into mushrooms. Took filled mushroom and pressed it into bread crumb mixture. Placed a dozen on sheet and baked them at 375 for 30 minutes. Upped it to 400 for another 10 minutes and they browned very nicely. They were delicious. Hi Craig! Thanks for the extra tips, glad you liked this.